Aim: All microbes (e.g., bacteria, fungi, virus, and parasite) capable of infection have coupled with high levels of multidrug resistance (MDR) which leads to the significant morbidity and mortality. The present study deals with the development of novel imidazolidin-2-one-1,3,5-triazine conjugates via facile synthetic route. Methods: The structure of the target derivatives were ascertained by using various spectroscopic analyses. These compounds were assessed for the determination of inhibitory activity against Enterovirus 71 and Coxsackievirus A16. Result: The results of the investigation revealed that, entire set of target derivatives showed considerable inhibition against both the tested virus in plaque reduction inhibitory assay with no cytotoxicity. Conclusion: All target derivatives were synthesized and showed considerable inhibition against both the tested virus along with no cytotoxicity. Synthesis, 1,3,5-triazine, imidazolidin-2-one, Enterovirus 71, Coxsackievirus A16. The rise of antimicrobial resistance to currently available therapeutic regimens for the treatment of infections has sternly affected the safety of public across the globe [1,2]. Almost all microbes (e.g., bacteria, fungi, virus, and parasite) capable of infection have coupled with high levels of multidrug resistance (MDR) which leads to the significant morbidity and mortality [3-5]. It frequently coupled with increased healthcare cost and prolonged hospital days . Despite of better understanding of pathogenesis of infection, the rate of discovery of new drugs is declining more rapidly in contrast to rate at which microbes acquired resistance . Therefore, this has put selective pressure on the discovery of new medicines and has less chance of resistance due to the presence structural diversity . The hand, foot, and mouth disease (HFMD) is a common viral infection caused by Enterovirus belonging to the family Picornaviridae [9,10]. It majorly affects infants and children younger than 5 years old causing rashes, with rare instance of neurological disorder that can swiftly get worse to cardiopulmonary collapse . According to recent estimates of WHO, China is severally affected by HFMD which is responsible for 431 deaths and 1,520,274 new infections up to end of July in 2012 . Despite of advances in pathogenesis and etiology of the disease, no direct acting antiviral drugs are currently available to treat severe infection . Therefore, the discovery of novel drug is urgently needed. Recently, Shia et al. has reported the discovery the pyridyl imidazolidinones as a novel class of entreroviral 71 inhibitor . It acts via engaging the caspid protein. 1,3,5-triazine is also reported to exhibit number of pharmacological activity, such as, antibacterial , antimalarial , antidiabetic , CFTR inhibitor , carbonic anhydrase inhibitor  and antiviral agent . Prompted by the above, the present manuscript deals with the development of novel conjugates of imidazolidin-2-one with 1,3,5-triazine as inhibitor of Enterovirus 71 and Coxsackievirus A16 to bring novel chemical diversity. The chemical used in the present study was procured from Sigma Aldrich (USA). The spectra of 1H NMR and 13C NMR were recorded on Bruker Avance 400 and Bruker Avance 500 Spectrophotometer, respectively. The chemical shifts are expressed in parts per million (ppm), and coupling constants are expressed in Hertz (Hz). The Low-resolution mass spectrum (MS) was recorded on a Waters ZQ LC/MS single quadrupole system equipped with an electrospray ionization (ESI) source. The elemental analysis of the final derivatives was performed via Vario Elemental analyser. The Thin-layer chromatography was performed on 0.25 mm Merck silica gel plates (60F-254) and visualized under UV light. The synthesis of mono-substituted 1,3,5-triazine was performed in accordance with earlier reported procedure. The solution of 2,4,6-tri chloro-1,3,5-triazine (1) (0.1 mol) in 25 mL acetone maintain the temperature 0-5°C and strong ammonia solution (0.1 mol) was added constantly to above solution and stirred for 3 h followed by addition of NaHCO3. The products was filtered and washed with cold water and recrystallized with ethanol to afford pure products . 4,6-dichloro-1,3,5-triazin-2-amine 2 (0.1 mol) was added into 50 mL of acetone maintaining temperature 40-45°C and pyridin-4-amine solution (0.1 mol) was added constantly to above solution and stirred for 6 h followed by addition of NaHCO3. The products was filtered and washed with cold water and recrystallized with ethanol to afford pure products . 6-chloro-N2-(pyridin-4-yl)-1,3,5-triazine-2,4-diamine 3 (0.1 mol) was added in to 60 mL of 1,4 dioxane maintaining temperature 100-110°C. Different aromatic and aliphatic amine (a-j) (0.1 mol) solution were added constantly to above solution and reflex for 8-9 h followed by addition of K2CO3 (0.1 mol). The product was filtered and washed with cold water and recrystallized with ethanol to afford the corresponding pure product 4 (a-j). To stirring solution of 6-substituted-N2-(pyridin-4-yl)-1,3,5- triazine-2,4-diamine 4 (a-j) (0.01 mol) in ethanol (25 mL) and 2-Chloroethyl isocyanate (0.01 mol) was added, the reaction mixture was stirred at room temperature for 1 to 3 days. The solvent was evaporated under reduced pressure, and the compound was purified by flash chromatography to give intermediate 5 (a-j) respectively. To ice cold solution of intermediate 5 (a-j) (0.01 mol) in dry THF (30 mL) maintaining temperature 0–5°C and Sodium hydride (0.03 mol) was added to above solution, the reaction mixture was stirred at room temperature for 6 h. The solvent was evaporated under reduced pressure and aqueous phase was extracted thrice by methylene chloride (25 mL). The organic phases were washed with brine (30 mL), dried over anhydrous sodium sulphate and the compound was purified by flash chromatography to give title compounds 6 (a-j) respectively. Yield: 79%; MP: 183-184°C; MW: 382.81; Rf: 0.68; FT-IR (νmax; cm-1 KBr): 3389 (N-H str), 3071 (Ar C-H str), 1712 (C=O str), 1628 (C=Nstr), 1104 (C-N str ), 712 (-C-Cl str) cm-1; 1H-NMR (400MHz, DMSO, TMS) δ ppm: 8.47-7.02 (m, 4H, Pyridine), 7.67-7.21 (m, 4H, ArH), 6.02 (s, 1H, NHimidazolidin- 2-one), 3.96 (s, 2H, -NHX2), 3.43-3.39 (m, 4H, imidazolidin-2-one); 13C-NMR (100 MHz, CDCl3) δ,ppm: 176.4, 168.8, 165.6, 158.7, 155.3, 150.3, 137.2, 129.7, 127.8, 122.3, 109.2, 28.8, 27.9; Mass : 382.87 (M+1); Elemental analysis for C17H15ClN8O: Calculated: C, 53.34; H, 3.95; N, 29.27; Found: C, 53.37; H, 3.92; N, 29.31. Yield: 71%; MP: 188-189°C; MW: 382.81; Rf: 0.63; FT-IR (νmax; cm-1 KBr): 3384 (N-H str), 3075 (Ar C-H str), 1706 (C=O str), 1624 (C=Nstr), 1108 (C-N str ), 718 (-C-Cl str) cm-1; 1H-NMR (400MHz, DMSO, TMS) δ ppm: 8.46-7.04 (m, 4H, Pyridine), 7.52-6.81 (m, 4H, ArH), 6.04 (s, 1H, NHimidazolidin- 2-one), 3.98 (s, 2H, -NHX2), 3.45-3.41 (m, 4H, imidazolidin-2-one); 13C-NMR (100 MHz, CDCl3) δ,ppm: 176.4, 168.6, 165.9, 158.3, 155.4, 150.5, 143.8, 135.2, 130.7, 122.4, 116.9, 115.7, 109.2, 28.7, 27.8; Mass : 382.84 (M+1); Elemental analysis for C17H15ClN8O: Calculated: C, 53.34; H, 3.95; N, 29.27; Found: C, 53.35; H, 3.98; N, 29.24. Yield: 67%; MP: 193-194°C; MW: 382.81; Rf: 0.69; FT-IR (νmax; cm-1 KBr): 3387 (N-H str), 3077 (Ar C-H str), 1702 (C=O str), 1621 (C=Nstr), 1104 (C-N str ), 715 (-C-Cl str cm -1; 1H-NMR (400MHz, DMSO, TMS) δ ppm: 8.48-7.01 (m, 4H, Pyridine), 8.21-6.78 (m, 4H, ArH), 6.01 (s, 1H, NHimidazolidin- 2-one), 3.94 (s, 2H, -NHX2), 3.44-3.42 (m, 4H, imidazolidin-2-one); 13C-NMR (100 MHz, CDCl3) δ,ppm: 176.3, 168.8, 165.6, 158.5, 155.3, 150.2, 136.4, 130.9, 127.7, 125.4, 122.9, 122.1, 109.2, 28.7, 27.9; Mass : 382.78 (M+1); Elemental analysis for C17H15ClN8O: Calculated: C, 53.34; H, 3.95; N, 29.27; Found: C, 53.31; H, 3.97; N, 29.29. Yield: 83%; MP: 173-174°C; MW: 366.35; Rf: 0.72; FT-IR (νmax; cm-1 KBr): 3393 (N-H str), 3081 (Ar C-H str), 1709 (C=O str), 1624 (C=Nstr), 1174 (C-F str), 1107 (C-N str ), 617 cm-1; 1H-NMR (400MHz, DMSO, TMS) δ ppm: 8.47-6.97 (m, 4H, Pyridine), 7.43-7.32 (m, 4H, ArH), 6.04 (s, 1H, NHimidazolidin- 2-one), 3.98 (s, 2H, -NHX2), 3.43-3.41 (m, 4H, imidazolidin-2-one); 13C-NMR (100 MHz, CDCl3) δ,ppm: 176.4, 168.8, 165.7, 158.9, 157.4, 155.4, 150.3, 134.6, 120.7, 116.4, 109.2, 28.7, 27.9; Mass : 367.38 (M+1); Elemental analysis for C17H15FN8O: Calculated: C, 55.73; H, 4.13; N, 30.59; Found: C, 55.68; H, 4.09; N, 30.58. Yield: 69%; MP: 179-180°C; MW: 366.35; Rf: 0.79; FT-IR (νmax; cm-1 KBr): 3397 (N-H str), 3085 (Ar C-H str), 1704 (C=O str), 1627 (C=Nstr), 1172 (C-F str), 1109 (C-N str ), 618 cm-1; 1H-NMR (400MHz, DMSO, TMS) δ ppm: 8.45-6.98 (m, 4H, Pyridine), 7.78-6.65 (m, 4H, ArH), 6.01 (s, 1H, NHimidazolidin- 2-one), 3.96 (s, 2H, -NHX2), 3.44-3.42 (m, 4H, imidazolidin-2-one); 13C-NMR (100 MHz, CDCl3) δ,ppm: 176.5, 168.7, 165.3, 163.9, 158.8, 155.4, 150.3, 144.2, 131.1, 113.5, 110.5, 109.2, 104.8, 28.7, 27.7; Mass : 367.31 (M+1); Elemental analysis for C17H15FN8O: Calculated: C, 55.73; H, 4.13; N, 30.59; Found: C, 55.67; H, 4.15; N, 30.61. Yield: 77%; MP: 184-185°C; MW: 366.35; Rf: 0.63; FT-IR (νmax; cm-1 KBr): 3394 (N-H str), 3087 (Ar C-H str), 1707 (C=O str), 1629 (C=Nstr), 1173 (C-F str), 1108 (C-N str ), 734 cm -1; 1H-NMR (400MHz, DMSO, TMS) δ ppm: 8.46-6.99 (m, 4H, Pyridine), 6.97-6.61 (m, 4H, ArH), 6.04 (s, 1H, NHimidazolidin- 2-one), 3.98 (s, 2H, -NHX2), 3.46-3.43 (m, 4H, imidazolidin-2-one); 13C-NMR (100 MHz, CDCl3) δ,ppm: 176.4, 168.7, 165.9, 158.9, 155.4, 154.8, 150.2, 128.2, 125.2, 123.8, 123.5, 116.4, 109.2, 28.7, 27.9; Mass : 367.38 (M+1); Elemental analysis for C17H15FN8O: Calculated: C, 55.73; H, 4.13; N, 30.59; Found: C, 55.76; H, 4.12; N, 30.64. Yield: 85%; MP: 213-214°C; MW: 427.26; Rf: 0.75; FT-IR (νmax; cm-1 KBr): 3398 (N-H str), 3083 (Ar C-H str), 1714 (C=O str), 1622 (C=Nstr), 1104 (C-N str ), 1094 (C-Br str), 732 cm -1; 1H-NMR (400MHz, DMSO, TMS) δ ppm: 8.47-6.98 (m, 4H, Pyridine), 7.35-7.01 (m, 4H, ArH), 6.05 (s, 1H, NH- imidazolidin-2-one), 3.97 (s, 2H, -NHX2), 3.45-3.42 (m, 4H, imidazolidin-2-one); 13C-NMR (100 MHz, CDCl3) δ,ppm:176.3, 168.8, 165.7, 158.9, 155.4, 150.3, 137.8, 132.5, 118.6, 116.7, 109.2, 27.9, 28.6; Mass : 428.25 (M+1); Elemental analysis for C17H15BrN8O: Calculated: C, 47.79; H, 3.54; N, 26.23; Found: C, 47.83; H, 3.52; N, 26.27. Yield: 73%; MP: 218-219°C; MW: 427.26; Rf: 0.62; FT-IR (νmax; cm-1 KBr): 3395 (N-H str), 3087 (Ar C-H str), 1718 (C=O str), 1626 (C=Nstr), 1109 (C-N str ), 1092 (C-Br str), 731 cm-1; 1H-NMR (400MHz, DMSO, TMS) δ ppm: 8.45-6.97 (m, 4H, Pyridine), 7.57-6.71 (m, 4H, ArH), 6.03 (s, 1H, NHimidazolidin- 2-one), 3.98 (s, 2H, -NHX2), 3.44-3.43 (m, 4H, imidazolidin-2-one); 13C-NMR (100 MHz, CDCl3) δ,ppm: 176.3, 168.8, 165.7, 158.9, 155.4, 150.3, 144.7, 130.7, 123.8, 121.7, 116.9, 115.5, 109.2, 28.7, 27.7; Mass : 428.28 (M+1); Elemental analysis for C17H15BrN8O: Calculated: C, 47.79; H, 3.54; N, 26.23; Found: C, 47.75; H, 3.59; N, 26.19. Yield: 65%; MP: 228-229°C; MW: 427.26; Rf: 0.57; FT-IR (νmax; cm-1 KBr): 3399 (N-H str), 3083 (Ar C-H str), 1712 (C=O str), 1628 (C=Nstr), 1103 (C-N str ), 1099 (C-Br str), 735 cm -1; 1H-NMR (400MHz, DMSO, TMS) δ ppm: 8.47-6.99 (m, 4H, Pyridine), 7.55-6.52 (m, 4H, ArH), 6.04 (s, 1H, NH- imidazolidin-2-one), 3.96 (s, 2H, -NHX2), 3.45-3.44 (m, 4H, imidazolidin-2-one); 13C-NMR (100 MHz, CDCl3) δ,ppm:176.3, 168.8, 165.9, 158.7, 155.4, 150.3, 150.1, 132.4, 128.6, 126.2, 118.7, 117.4, 109.1, 28.7, 27.8; Mass : 428.29 (M +1); Elemental analysis for C17H15BrN8O: Calculated: C, 47.79; H, 3.54; N, 26.23; Found: C, 47.78; H, 3.56; N, 26.26. Yield: 83%; MP: 204-205°C; MW: 393.36; Rf: 0.84; FT-IR (νmax; cm-1 KBr): 3395 (N-H str), 3087 (Ar C-H str), 1718 (C=O str), 1625 (C=Nstr), 1528 (NO2 str), 1108 (C-N str ), 728 cm-1; 1H-NMR (400MHz, DMSO, TMS) δ ppm: 8.45-6.98 (m, 4H, Pyridine), 8.02-6.92 (m, 4H, ArH), 6.02 (s, 1H, NHimidazolidin- 2-one), 3.97 (s, 2H, -NHX2), 3.43-3.42 (m, 4H, imidazolidin-2-one); 13C-NMR (100 MHz, CDCl3) δ,ppm: 176.3, 168.8, 165.7, 158.8, 155.3, 150.2, 145.3, 137.8, 124.7, 119.3, 109.2, 28.7, 27.8; Mass : 394.38 (M+1); Elemental analysis for C17H15N9O3: Calculated: C, 51.91; H, 3.84; N, 32.05; Found: C, 51.95; H, 3.81; N, 32.08. Monolayer of RD cells cultured in 6-well plates was infected with enterovirus 71 (EV71) and coxsackievirus A16 (COX A16) (50 pfu per well) in the presence or absence test compounds (1, 10, 50, 100, 150 μg/mL) for 1 h in a 37°C, 5% CO2 incubator. Medium containing 3% agarose (2 mL per well) was used to cover cell monolayer. After 2-day incubation at 37°C in a CO2 incubator, cell monolayer was stained with 0.1% Crystal Violet and plaque number further counted. Fifty percent (50%) inhibitory concentration (IC50) reducing number of plaques by 50% was calculated by computer program. The cytotoxicity induced by compounds on LLC-PK1 cell line was determined using the MTT [3-(4,5-dimethylthiazol-2- yl)-2,5-diphenyl-2H-tetrazolium bromide] assay. The cells were seeded in 96-well cell culture plates in a volume of 100 μL containing 5000 c/w for LLC-PK1 cells in the culture medium and grown for 24 h prior to dosage. The medium was then restored with a fresh medium containing compounds at diverse concentrations (40-0.05 μg/mL). After 2 and further incubation of 24 h at 37°C, the medium was removed, the cells were washed with phosphate buffer solution (PBS, pH 7.4) and then 10 μL of MTT solution (5 mg/mL in PBS) were added to the each well. Formazan crystals were dissolved in 100 μL of a sodium dodecylsulfate solution (10% of SDS in HCl 0.01 M) and mixed with the above mixture which was further incubated for 4h. After overnight incubation (12-14 h) the absorbance was measured at 595 nm with a Tecan Ultra Evolution microplate reader. The mean absorbance for each dose of compound was expressed as a percentage of the untreated control well absorbance. The desired compounds 2, 3, 4(a-j), 5(a-j) and 6(a-j) were synthesised by the protocols as shown in Scheme 1. In first step, synthesis of mono-substituted 1,3,5-triazines 2 was achieved by the nucleophilic substitution of Cl atom of the 2,4,6-trichloro-1,3,5-triazine (1) with excess amount of ammonia gas. Whereas, in the second step, synthesis of disubstituted 1,3,5-triazines (3) was accomplished by nucleophilic substitution of the Cl atom of mono-substituted 1,3,5-triazines (2) with pyridin-4-amine. Whereas, in the third step, synthesis of tri-substituted 1,3,5-triazines 4 (a-j) were accomplished by the nucleophilic substitution at Cl atom of disubstituted 1,3,5-triazine (3) with different amines (a-j) as shown in Scheme 1. In the fourth step, synthesis of intermediate compounds 5(a-j) was accomplished by the reaction of 2-chloroethyl isocyanate with tri-substituted 1,3,5- triazine 4a-j. Moreover, the fifth step corresponds to the synthesis of title compounds 6 (a-j) via cyclization of side chain of 1-(2-chloroethyl) urea at 1,3,5- triazine by addition of sodium hydride. Scheme 1: Reagents and conditions: R (a-j) various amines (i) Ammonia solution, Acetone, stirr 3 h at 0-5°C, NaHCO3 (ii) pyridin-4-amine, Acetone, stirr 6h at 40-45 °C , NaHCO3 (iii) R-H (a-j) various amines 1,4 dioxane, Reflux at 100-110°C for 8-9 h, K2CO3 (iv) 2-Chloroethyl isocyanate, stirred at room temp for 1 to 3 days (v) Sodium hydride, dry THF, stir 6 h at room temp. Enterovirus 71 (EV71) and Coxsackievirus A16 (COX A16) are two viruses belonging to the Picornaviridae family, deemed as the causative agents of Hand, foot and mouth disease (HFMD). It is a common infectious disease affecting mainly infants and children. As per World Health Organization (WHO), over two million cases were diagnosed in the year 2013, including Japan, Vietnam, Singapore and making China as top most affecting country with 1,855,457 cases . Currently, there is no antiviral drug for the treatment this infection, thus, synthesized analogues were also tested for its inhibitory activity against EV71 and COX A16 showed in Table 1. In Plaque reduction inhibitory assay, target analogues showed diverse range of inhibition. Compound 6a showed considerable inhibition of infection with IC50 of 15.53 and 19.30 μM against EV71 and COX A16, respectively. The activity has been improved more than three fold in the case of compound 6b against EV17 with mild reduction against COX A16. The further drastic reduction in activity was observed in the case of compound 6d and 6e against both the tested virus. However, a substantial improvement in activity was reported by compound 6f and 6g, isomeric substitution of methyl group, on meta and ortho, respectively. Further loss in activity was reported by compounds having the hydroxyl group against EV71 and COX A16, except compound 6j which showed prominent inhibition among all the derivatives against EV71. It showed significant inhibition of infection against both the tested virus species. All synthesized derivatives showed no significant anti-viral activity as compared Ribavirin standard drug. No specific upsurge in activity was reported by the tested compounds, containing electron withdrawing substituent. It was indicated that, the inhibitory activity of the tested compounds does not follow any specific pattern of inhibition. Thus it would be hard to define any structural-activity relation for these compounds against EV71 and COX A16. Table 1: Antiviral activity of target compounds 6 (a-j) against Enterovirus 71 (EV71) and Coxsackievirus A16. It is highly desirable for potent bioactive compound that it highly desirable that, it should not associated with toxicity. Thus, the entire derivatives were tested for toxicity against LLC-PK1 cells at the dose of 50 μg/mL at 12 h showed in Table 2. Results showed that, none of the tested derivative exhibit significant toxicity at the tested dose for required time. Table 2: Cytotoxicity of compounds 6 (a-j) in LLC-PK1 cells. In conclusion the present study deals with the development of novel imidazolidin-2-one-1,3,5-triazine conjugates via facile synthetic route. The structure of the all synthesized derivatives was ascertained by using various spectroscopic analyses. All compounds were assessed for the determination of inhibitory activity against Enterovirus 71 and Coxsackievirus A16. The results of the investigation revealed that, entire set of target derivatives showed considerable inhibition against both the tested virus in plaque reduction inhibitory assay with no cyto toxicity. Frieden T. Antibiotic resistance threats. Cdc, 2013; 22-50. Report, Global. Antimicrobial Resistance. Bulletin of the World Health Organization 2014; 61: 383-394. Tanwar J, Das S, Fatima Z, Hameed S, Tanwar J, Das S, Hameed S. Multidrug Resistance: An Emerging Crisis, Multidrug Resistance: An Emerging Crisis. InterdiscipPerspect Infect Dis 2014; e541340. Teodori E, Dei S, Scapecchi S, Gualtieri F. The Medicinal Chemistry of Multidrug Resistance (MDR) Reversing Drugs. Farmaco, 2002; 57: 385-415. Wells CD,Cegielski JP,Nelson LJ,Laserson KF,Holtz TH,Finlay A,Castro KG,Weyer K. HIV Infection and Multidrug-Resistant Tuberculosis--The Perfect Storm. J Infect Dis 2007; 196: S86- S107. Sokol MC,McGuigan KA,Verbrugge RR,Epstein RS. Impact of Medication Adherence on Hospitalization Risk and Healthcare CostMedCare2005; 43: 521-530. Coffin JM. HIV Population Dynamics in Vivo: Implications for Genetic Variation, Pathogenesis, and Therapy. Science 1995; 267: 483-489. Galloway WRJD, Isidro-Llobet A, Spring DR. Diversity-oriented synthesis as a tool for the discovery of novel biologically active small molecules. Nat Commun 2010; 1: 1-13. Rabenau HF,Richter M,Doerr HW. Hand, Foot and Mouth Disease: Seroprevalence of Coxsackie A16 and Enterovirus 71 in Germany. Med MicrobiolImmunol 2010; 199:45-51. Wong SSY, Yip CCY, Lau, SKP, Yuen K. Y. Human Enterovirus 71 and Hand, Foot and Mouth Disease. Epidemiol Infect., 2010; 138:1071-1089. Wu SK,Lin HH,Li YC,Tsai CL,Cairney J. Cardiopulmonary Fitness and Endurance in Children with Developmental Coordination Disorder. Res DevDisabil2010; 31:345-349. Yin XG,Yi HX,Shu J,Wang XJ,Wu XJ,Yu LH. Clinical and Epidemiological Characteristics of Adult Hand, Foot, and Mouth Disease in Northern Zhejiang, China, BMC Infect Dis 2014; 14: 251. Pawlotsky JM. Treatment Failure and Resistance with Direct-Acting Antiviral Drugs against Hepatitis C Virus. Hepatology2011; 53:1742­-1751. Shia KS,Li WT,Chang CM,Hsu MC,Chern JH,Leong MK,Tseng SN,Lee CC,Lee YC,Chen SJ,Peng KC,Tseng HY,Chang YL,Tai CL,Shih SR. Design, Synthesis, and Structure-Activity Relationship of PyridylImidazolidinones: A Novel Class of Potent and Selective Human Enterovirus 71 Inhibitors. J Med Chem 2002; 45: 1644-1655. Singh UP, Pathak M, Dubey V, Bhat HR, Gahtori P, Singh RK. Design, synthesis, antibacterial activity, and molecular docking studies of novel hybrid 1,3-thiazine-1,3,5-triazine derivatives as potential bacterial translation inhibitor. ChemBiol Drug Des 2012; 80: 572-583. Bhat HR, Singh UP, Thakur A, Kumar Ghosh S, Gogoi K, Prakash A, Singh RK. Synthesis,antimalarialactivity and molecular docking of hybrid4-aminoquinoline-1,3,5-triazine derivatives. ExpParasitol2015; 157: 59-67. Srivastava, JK, Dubey P, Singh S,Bhat HR, Kumawat MK, Singh UP. Discovery of novel 1,3,5-triazine-thiazolidine-2,4-diones as dipeptidyl peptidase-4 (DPP-4) inhibitor targetingS1pocket for the treatment of type 2 diabetes along with antibacterial activity. RSC Adv2015; 5: 14095-14102. 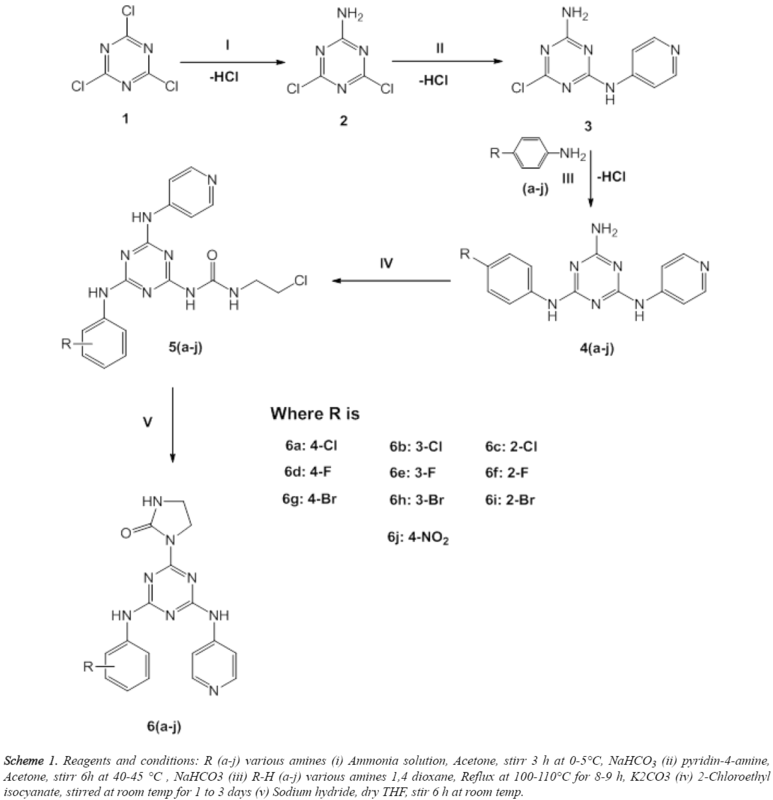 Srivastava JK, Awatade NT,Bhat HR, Kmit A, Mendes K, Ramos M, Amaral MD, Singh UP.Pharmacological evaluation of hybrid thiazolidin-4-one-1,3,5-triazines for NF-κB, biofilm and CFTR activity. RSC Adv2015; 5: 88710-88718. Garaj V,Puccetti L,Fasolis G,Winum JY,Montero JL,Scozzafava A,Vullo D,Innocenti A,Supuran CT. Carbonic Anhydrase Inhibitors: Novel Sulfonamides Incorporating 1,3,5-Triazine Moieties as Inhibitors of the Cytosolic and Tumour-Associated Carbonic Anhydrase Isozymes I, II and IX. Bioorg Med ChemLett2005; 15: 3102-3108. Lozano V,Aguado L,Hoorelbeke B,Renders M,Camarasa MJ,Schols D,Balzarini J,San-Félix A,Pérez-Pérez MJ. Targeting HIV Entry through Interaction with Envelope Glycoprotein 120 (gp120): Synthesis and Antiviral Evaluation of 1,3,5-Triazines with Aromatic Amino Acids. J Med Chem. 2011; 54:5335-5348.